It was the morning of June 25 – World Vitiligo Day – when Lauren Reid uploaded the first photo to her new Instagram account and anxiously waited to see what would happen. The post was the first of what Lauren hoped would become an inspirational project within the vitiligo community. 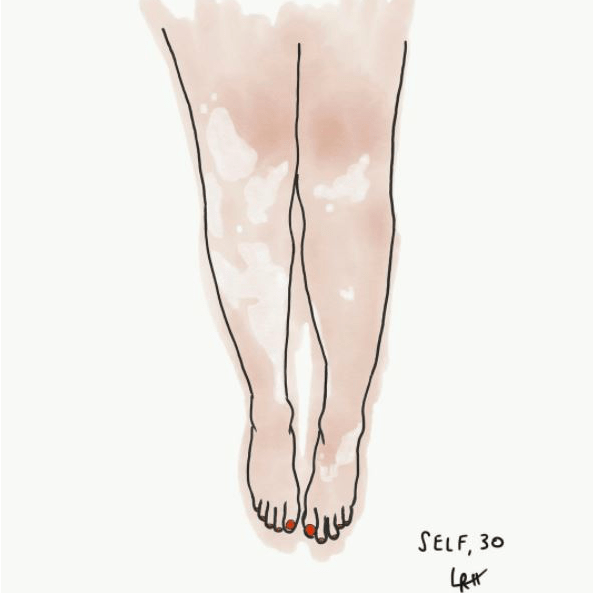 Calling her account “Pigment & Paint,” Lauren had painted a watercolor illustration of her own vitiligo and was hoping others might let her paint them too – and share their stories. Within the hour, she had her answer as requests started to flow in. Today Lauren has painted 32 portraits and has dozens more waiting to be done, with submissions coming in from around the United Sates and even from countries around the world. Participants submit their story and a photo or a few photos that show their vitiligo and Lauren gets to work, crafting the story and painting their portrait. 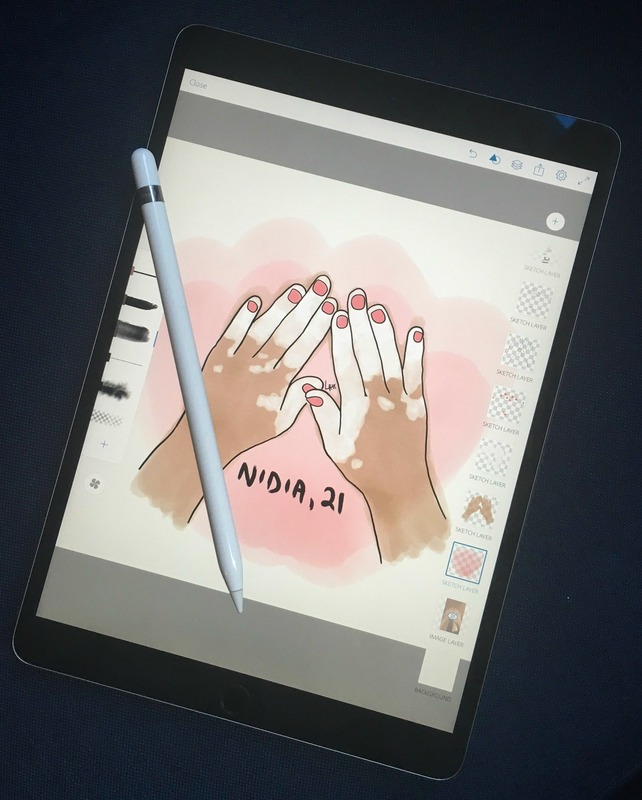 A self-taught artist, Lauren really got into illustrating when she bought an iPad Pro earlier this year. 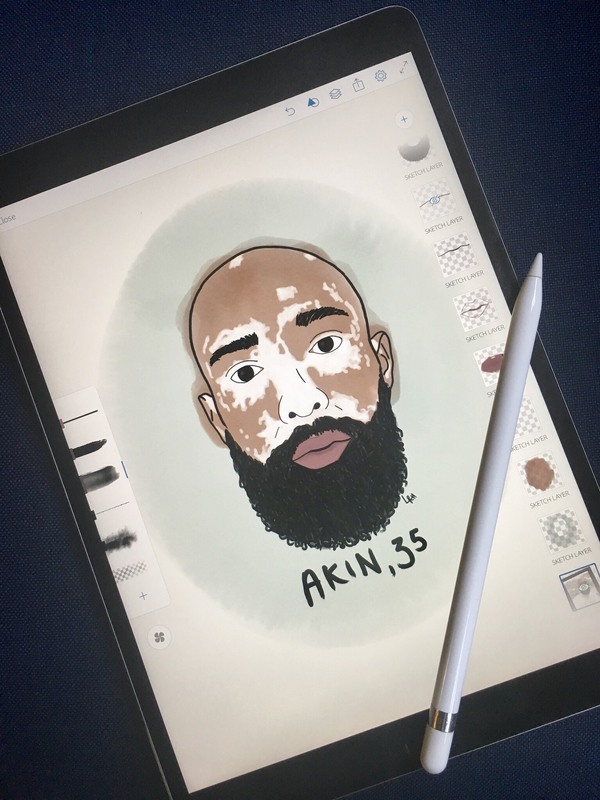 The vitiligo portraits are created digitally using iPad Pro and Magic Pencil along with Adobe Sketch. And as a New York City native, the digital medium saves Lauren space in her small city apartment. Lauren first got vitiligo 19 years ago, at the age of 12, when a spot appeared on her right knee and started to spread to other areas of her body. For a decade, she saw a dermatologist and tried almost every treatment available before deciding to leave medicine behind and focus on accepting it. It was solely on a whim that she decided to paint her own vitiligo one day, and turned to Facebook to share her finished work. Receiving an overwhelmingly positive response, Lauren came up with the idea to create an account where she could do the same for others. Hopping on Reddit to connect with the vitiligo community, she learned that the very next day – June 25 – was World Vitiligo Day. Inspired by the timing, Lauren rolled up her sleeves, picked a name and launched the account not even 24 hours later with her self-portrait, personal story and a call for submissions. And she’s right – scrolling through the Pigment & Paint Instagram account, you can’t help but feel inspired by the stories, shared one portrait at a time. Follow Lauren via “@PigmentPainter” on Instagram and Facebook. Submissions can be sent to PigmentPainter@gmail.com with a photo of your vitiligo and your story.